Emilio Aguinaldo photograph courtesy of Institut für Völkerkunde (Institute of Social Anthropology), University of Vienna. Frederick N. Funstons service record compiled in 1903 by the Adjutant Generals Office. Commanded his regiment en route to and at San Francisco, California to October 27, 1898, when he sailed with it for the Philippine Islands, arrived Manila Nov. 30, and served there-into September 3, 1899, being in command of the 1st Brigade, 2d Division, 8th Army Corps, May 22 to July 4, 1899. He was absent sick and on leave, September 3 to December 26, 1899. In command of the 3d Brigade, 2d Division 8th Army Corps January 5 to April, 1900; the 4th District, Department of Northern Luzon, to September, 1901, during which period he was frequently in the field in active operations, and in the capture of Aguinaldo, March 23, 1901. Sick in Hospital and on sick leave, to April 10, 1902. Commanding Department of the Colorado to March 18, 1903, and commanding the Department of the Columbia since March 23, 1903. He was awarded the Medal of Honor, February 14, 1900, for most distinguished gallantry in action at Rio Grande de la Pampanga, April 27, 1899, when Colonel, 20th Kansas Infantry, in crossing the river on a raft and by his skill and daring enabling the General Commanding to carry the enemys entrenched position on the north bank of the river and drive him with great loss from the important strategic position of Calumpit. Recommended by Major General [Arthur] MacArthur for brevet of Major General of Volunteers for gallant and meritorious services throughout the campaign against Filipino insurgents from February 4 to July 1, 1899. March 28, 1901, General MacArthur cabled, describing the capture of Aguinaldo on March 23, 1901. The Twain article appeared at about the time Gen. Funston spoke in Denver, and criticized those who did not support the war in the Philippines. A small article appeared in the April 21st Washington, D.C., newspaper about Funstons speech. Gen. Funston Scores Men Who Oppose Holding the Philippines. I call attention to the enclosed report of a speech by General Funston. The reference to the senior senator from Massachusetts is entirely improper in a general of the army. I think that General Funston will have to be requested not to make any more public speeches. I appreciate to the full his great services. I am in cordial sympathy with his general view on the Philippines, but he expresses himself at times in a way that is very unfortunate. Speaking on behalf of the wholesale merchants and manufacturers of San Francisco, this Association earnestly requests you appoint Brigadier General Funston to the position of Major General of the United States Army to fill the first vacancy occuring in that grade. We understand that Brigadier General Funston is the ranking Brigadier General of the line of the Army and in view of his splendid record in the Philippines and his great services to San Francisco when our City was devastated by earthquake and fire, we respectfully urge that General Funston is entitled to and should receive the promotion in question. As America prepared for World War I, President Woodrow Wilson and Secretary of War Newton D. Baker believed Gen. Funston was the right officer to command the Allied Expeditionary Force (AEF) to France. Funston, however, died February 19, 1917, and the AEF command was given to Gen. John Pershing. 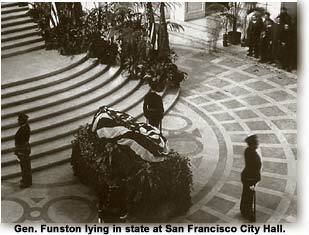 Brigadier General Funston laid in state at San Franciscos City Hall rotunda on February 23rd and 24th, 1917, and was buried at the Presidio. It was February 19 1917, and I had the night watch for the General Staff. My old friend, Peyton March, a lieutenant Colonel in the Adjutant Generals Department, had a similar duty in that office. Secretary Baker was giving a formal dinner that night for the President and left word not to be disturbed unless something of importance took place. About 10 oclock March brought up a wire that General Funston, who had been informally selected to command an American Expeditionary Force if we entered the war, had just dropped dead in the St. Anthony Hotel in San Antonio. We agreed that the Secretary should be told at once. When I reached the Secretarys home, the butler refused to let me enter, saying that he had orders to admit no one. The dining room looked out on the entrance hall and I could see it plainly. It was a gay party, with lights and laughter, the tinkle of glasses, the soft music from an alcove, the merry quips and jokes of a cosmopolitan group. I finally pushed by the butler and tried to attract the attention of the Secretary so I could report to him privately what had occurred. But the President saw me and sang out in the most jovial manner, Come in, Major, and tell all of us the news. There are no secrets here. There was a general clapping of hands at this, and I knew I was in for it. So I clicked my heels together, saluted him, and barked in a drill-sergeant tone, Sir, I regret to report that General Funston has just died. Had the voice of doom spoken, the result could not have been different. The silence seemed like that of death itself. You could hear your own breathing. Then, I never saw such a scattering of guests in my life. It was a stampede. 17-24511: Tomlinson, Everett Titsworth, 1859- Scouting with General Funston, Garden City, New York, Doubleday, Page & company, 1917. xi, 243,  p. front., plates. 20 cm. 11-28373: Funston, Frederick, 1865-1917. Memories of two wars; Cuban and Philippine experiences, New York, C. Scribners sons, 1911. xv, 451 p. front. (port.) plates. 24 cm..
01-10174: Halstead, Murat, 1829-1908. Aguinaldo and his captor; Cincinnati, The Halstead publishing company, 1901. p. cm..
90-184403: Crouch, Thomas W., 1932- A leader of volunteers : Frederick Funston and the 20th Kansas in the Philippines, 1898-1899 / Lawrence, Kan. : Coronado Press, 1984. xi, 249 p., 14 leaves of plates : ill. ; 22 cm..
86-4938: Bain, David Haward. Sitting in darkness : Americans in the Philippines / New York : Penguin Books, c1986. 467 p. : ill. ; 20 cm..
84-8945: Bain, David Haward. Sitting in darkness : Americans in the Philippines / Boston : Houghton Mifflin, 1984. 464 p.,  p. of plates : ill. (some col.) ; 24 cm..
75-20193: Crouch, Thomas W., 1932- A Yankee guerrillero : Frederick Funston and the Cuban insurrection, 1896-1897 / [Memphis] : Memphis State University Press, c1975. vii, 165 p. : ill. ; 22 cm..